We made it! We left Lancaster around 9:30 a.m. yesterday with smooth sailing to JFK airport in New York. We arrived near the beginning of the ticketing line and walked the concourse for exercise. After boarding the plane around 4 p.m., one of the college students who is joining us found out that her mom had been critically injured in a car accident after dropping her daughter off for her ride to the airport. Amanda decided to get off the plane to be with her family during this crucial time. We are sad that Amanda was not able to fly with us, but upon arriving in Istanbul, we learned that her mother is stable enough and Amanda plans to join us tomorrow! We had a very smooth flight to Istanbul, with a helpful and fun crew. We all got a few winks of sleep. We were greeted at the airport by Feridun's wife Olcay, a gentleman named Bilal (both of them will be accompanying us on our entire trip, Mehmet (who will be with us while we're in Istanbul), and Osman, a videographer who was talking "shop" with Max as soon as we got to the hotel. 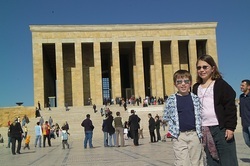 This afternoon we headed out to Miniaturk, the largest miniature city in the world. We saw many of the places where we're headed in the next 10 days. Max had some camera problems (and now his battery charger died), but we are grateful for Osman, the local film expert who is traveling with us in Instanbul. He's got connections to get us what we need! We had lunch at Miniaturk's Restaurant (kebabs, which we later found out isn't totally typical of this region). For dinner we feasted at Pirpirim, one of the finest restaurants in Istanbul; the owner also has started a successful Turkish restaurant in New York City. Lots of vegetables, lamb, and nice gentle tasty spices. It's a long day (about 30 hours with only a couple hours of sleep on the plane), and tomorrow we're going to museums! We wanted you all to know that we arrived safely and are enjoying beautiful Istanbul so far! What a perfect day we had today! We started off with a Turkish breakfast at the hotel--bread, yogurt, cheese, sandwich meats, fruit, olives, nuts, and much more! From there, we visited Suleymaniye Mosque, a beautiful, huge architectural monument that was built in the 1500s and is still used by Muslims for prayer. From there, we traveled a short distance to Kariye Museum, a former church built in the 900s. The mosaic icons in this building were breath-taking and showed many scenes from the life of Jesus. We had a delicious lunch overlooking a busy street. We ordered mincemeat for Max, which fortunately was not the same as the Pennsylvania Dutch pie that we know; he enjoyed this grilled thinly sliced meat. We said goodbye to Europe as we crossed the Bosporus Bridge and entered the Asia side of Istanbul. We visited Coskun College--the name of a private primary school on the side of a hill overlooking the Bosphorus Strait. Today was a special festival for the school in which students from 51 different areas of Turkey displayed projects they had made about their country. We didn't have time to see all of the projects, but met some really friendly students. The school has more than 1,000 students, and each grade has its own villa. From there we visited Samanyolu TV, the fifth largest network in Turkey. Since its founding in 1994, it has grown to four networks in several countries and 600 employees in Istanbul alone. Their aim is to provide family friendly entertainment, and they're starting a kids channel this summer. We saw a Nigerian children's choir recording in their studios. The staff was friendly, and almost as importantly, they fixed Max's camera from its temperamental condition! Next, we drove along the Bosphorus, saw the sun set over the Europe side of Istanbul, and ate a delicious meal in a restaurant overlooking the strait. Katia and Thaniel met friends this afternoon who had lived in the United States and speak English. Oh, another blessing, Amanda, whose mother was injured on Thursday, joined us today. Her mother is making a good recovery and is scheduled to return home from the hospital in a day or two. After an early and quick breakfast at the hotel, we loaded up and went to Istanbul Airport for a 45-minute flight to Ankara, the capital of Turkey. We checked into our hotel (a classy hotel in the shape of the letter A) and headed off to the Museum of Anatolyan Civilizations where we saw some of the 200,000 artifacts, most from many centuries BC. We had a delicious home-made lunch in the home of Umit and Nihal, along with Umit's sister Zeynep, niece Hatice, and nephew Omer. The women spent all day yesterday preparing the pinched dough around meat, lentil soup, salad, rice, bread, a lasagna-like dish, and syrup-glazed "cream of wheat" cakes for dessert. After the meal, Katia and Thaniel taught Omer and Hatice how to play Dutch Blitz. The family gave each person/family on our team a beautiful Turkish coffee set. What generosity! From there, we went to Ataturk's Mausoleum, which was closed due to tomorrow's holiday, so we went up a very tall tower in the middle of the city. The view was breathtaking! In the evening we had dinner with Umit's best friend and his family. the food was delicious and we ended up having a talent show of sorts with singing, poetry, and storytelling. The weather is a bit cooler in Ankara. We're having a wonderful time! If we don't have a post tomorrow, it's because of the full day of children's day activities. Thanks for your interest. If you have a question for us about what it's like in Turkey, please use our contact form and send us your question. We'll do our best to post the answer. We headed to the largest stadium in Ankara for the Children's Day festivities. There were hundreds, if not thousands, of children in various costumes on the field, demonstrating traditional dances. On the far side of the stadium children held placards that they changed to spell out messages and show images related to the day. Afterwards, Katia and Thaniel met children who performed. After a great meal with some our sponsors at Ankara's finest restaurant (and best-known baclava restaurant in the country), we visited Antikibir, memorial and mausoleum of Ataturk, the republic's founder. We finished our dinner at another sponsor's home. The man of the house owns a textile factory; the family gave beautiful scarves to the ladies. Thank you to everyone who is making this trip possible, especially our hosts! We had a restful day, especially Thaniel! You'll have to watch the documentary when it comes out to find out his perspective of our day. We finished the day by eating dinner at the home of Nedim and Didem. We had a delightful time together visiting together and looking at photos of Turkey. Ferit and Elif, the son and daughter, made Katia and Thaniel feel right at home. Thank you for your warm and welcoming hospitality! After a beautiful one-hour flight from Ankara to Izmir, we met some of the local sponsors and checked into our hotel. We had lunch (with turkey soup!) and a tour at one of the best hospitals in Turkey. From there, we went to a school, where Katia met some girls and a cat (Susi, pronounced Shushi). An American exchange student, Jonathon, gave Katia and Thaniel a tour of the school. We had a brief stop at the bay in Izmir before coming back to our hotel. We had another late - but very friendly night - at the home of our sponsors. It was a barbeque and we ate dinner on the porch overlooking their pool…. Very pretty! It was chilly, but we warmed up by the fireplace inside, chatted, and even got to teach some of the boys how to play Dutch Blitz. It's been a full six days so far. We're tired, but energized by our time with our new friends. We were all dragging today, especially Thaniel who wasn’t feeling well much of the day, but we got to visit some wonderful sites. We began at the house of the Virgin Mary, just outside of Selcuk, where it is believed she lived until the end of her life on earth. It was so peaceful there! The sun was shining, the birds were singing, and we got to smell flowers that looked like they grew on aloe vera, but smelled like jasmine. The house itself is a small stone building guarded at either entrance by two enormous ancient trees. It was special to be in a place where she was! From there we stopped in Selcuk for a typical lunch of flat pita (think flour tortilla) and shish kebabs. Right after lunch, we stopped at St. John’s Basilica. Perched atop a hill in a quaint town, the remains of this 4th century church were a sight to behold! St. John the Apostle’s tomb is there, as are many remnants of the church. Amidst the columns and bits of carved marble grew wildflowers, including red poppies. We very much enjoyed being there. Then we traveled on to the site of ancient Ephesus. It was so amazing, that we had to keep touching the remains of the buildings, fountains, and saying, “We’re touching history!” It was a wonderful opportunity to see ruins from the Greek and Roman times, both of which we had studied in school this year. We especially enjoyed seeing the library, the Roman latrine, and talking to each other (and hearing each other) from different parts of the huge amphitheater with incredible acoustics. How did they do that?!? We were amazed at the art, genius, and durability of the work of those people long ago. We returned to the hotel around 7 and split up: Kristina and the children grabbed a tiny supper there, packed for our early morning flight, and the children were in bed by 9:15 p.m. (the earliest yet for our trip). Timm and the rest went to meet with other host families at the home of Mehmet, who owns a clothing business. Thaniel is much better, for which we are grateful. We are enjoying our trip very much, and looking forward to a good night’s rest. Today was the longest day of the trip so far. We woke up at 5:15 a.m. to make it to the airport on time. We left Izmir and had a 45-minute flight back to Istanbul. We checked into the same hotel as last Friday and had some tea and breads at a nearby tea shop. We then visited an elementary school where Thaniel and a student together cut the ribbon dedicating the new play structure donated by Lancaster, Pa., based HomePlace Structures . The students sang a special song for us and applauded and cheered. One teacher told us how happy the students were to receive the playground. "It's a big event for them," she said as the students took turns playing and swinging. A special thanks goes out to Carl Smucker, owner, and Rich Sauder, chief operating officer, of HomePlace Structures, to Feridun Ayata of Red Rose Foundation and Ibrahim Ozkaya of Kimse Yok Mu for coordinating the donation. Katia and Thaniel also had the opportunity to sit in on a school class. There are about 600 students at the school; the English teacher told us that she has 55 students in a class, all at the same time.For me (Timm), this school visit was a highlight of the trip so far. The children were respectful (they stood up when we entered the room), outgoing (on the playground I was surrounded by "What is your name? "), and grateful (we were thanked over and over again). From there, we went to a fine dinner with the leaders of Bakiad, the organization in Turkey that coordinated our trip. They have 30 trips planned for May and 30 for June of groups of Americans and Canadians. Their goal is to help the world see and understand the Turkish people (and vice versa), and we're thankful to be recipients of their vision. Next, we visited a beautiful square between Istanbul University and a mosque. We fed the pigeons and visited an old book bazaar. We finished the evening with a visit to another sponsor's home on the west side of Istanbul. As we drove out of the downtown area, we were amazed by the amount of construction. We saw several highrise apartment building communities in progress, each to house maybe 50,000 people. We made it back to the hotel around midnight, and are glad that we can sleep in in the morning. Kristina was feeling tired and a bit sick today, and we hope that a good night's rest will strengthen her. We slept well; Kristina felt much better today. After breakfast at the hotel, we went to Dolmabahce Sarayi palace, one of the Ottoman Empire's extravagant mansions. The gardens were absolutely beautiful, with spring flowers and fountains, overlooking the Bosphorus Strait. The palace itself is Victorian style and fancy beyond belief. We had lunch at a cafeteria, and went to the wonderfully colorful Grand Bazaar (the oldest indoor shopping mall, built in 1490) and the equally colorful Spice Bazaar for some souvenir shopping. We only saw a fraction of the 4,000 shops and could have stayed much longer. We stopped for afternoon tea (and ice cream) at an outdoor plaza to the sounds of an accordion before heading to a dinner at a seafood restaurant. Now we're off to bed with another full touristy day tomorrow. Today was a full day, with a visit first to Hagia Sophia, the largest Christian Church in the world for over 900 years, now a museum. From there, we saw Topkapi Palace, the first and biggest Ottoman mansion and gardens. After lunch, we saw the Hippodrome; all that is left of the former arena are three towers. The surprise of the day was the Underground Cistern, a huge reservoir with more than 300 very tall columns. There is only a couple of feet of water remaining, with fish. The cistern is immense, it has lasted around 1,400 years, and there are houses and streets above it. We did a bit more shopping, took a boat ride on the Bosphorus as the sun was setting, and ate at a quaint restaurant. Now it's time to pack, say goodbye to our new friends, and head home. We’re back! We woke up and had breakfast at the hotel, said goodbye to Amanda, Erica, and Chrisinna, who are staying in Istanbul for two more days, and headed for the airport by 9:30 a.m. After teary goodbyes to our guides (now friends) Billal and Olcay, we boarded the plane for home. Our 10+ hour flight included two meals and two snacks (including Haagan Dazs ice cream), movies, and lots of water to keep us hydrated. One of Max’s employees picked us up at JFK airport, and we drove the three hours home, arriving around 10:10 p.m.
Turkey is a fascinating country--the people are warm, friendly, and generous; the historical sites beyond belief; and the food rich and wonderful. Favorite subject in school: Hmmm... Math and reading. Favorite things I like to do: Exercise on my yoga ball, read, play with my bro, write stories. Favorite foods: DASS* wraps, graham crackers and PB, pancakes and waffles, beans and rice and tortillas and cream cheese, etc. etc. Something silly about me: Whenever I get nervous, I either talk or giggle a lot. Instruments I play: Violin, piano, and flute, but I'm focusing on flute right now. What I’m looking forward to about visiting Turkey: Making new friends!! The country I’d like to visit after Turkey: Definitely France. *DASS stands for Dad's After School Snack; it's a mixture of peanut butter, raisins, and chocolate chips that Dad used to eat when he was young. Now he puts it in a flour tortilla, heats it until the chocolate chips melt, and it tastes great as a part of a nutritionally balanced meal. Favorite things I like to do: Exercise on my yoga ball, eat, read. My friends describe me as: Weird. If I could only take one book along on the trip, I’d take: I can't choose!!!!!!!! What I’m looking forward to about visiting Turkey: Making new friends!!! The country I’d like to visit after Turkey: Portugal.